Boston's award-winning Beacon Hill Hotel and Bistro combines the charm of a bed and breakfast with the amenities of a small European inn. With an almost-perfect location on Charles Street, Beacon Hill Hotel consistently ranks among the best small boutique hotels in Boston. If you're looking for the convenience of a downtown Boston hotel with the ambiance of a Beacon Hill home, you'll find it here. 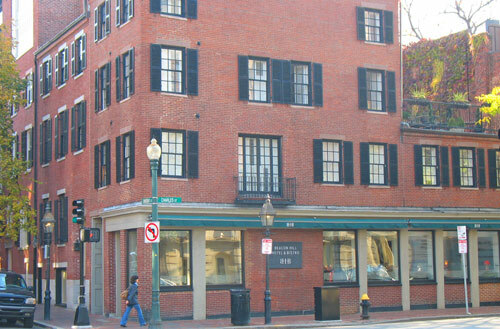 Location is part of what makes the Beacon Hill Hotel special for Boston vacations. 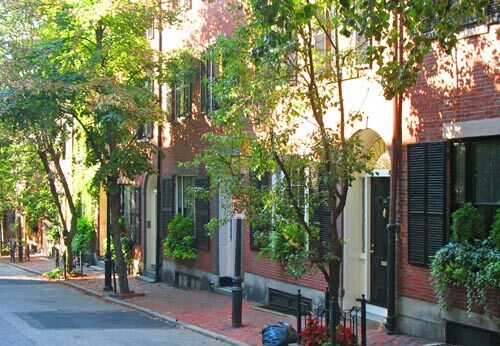 Explore the narrow cobblestone streets of this old historic neighborhood, browse in the Charles Street antique shops, and follow the Freedom Trail to experience Boston's history. Or walk over to the Charles River and enjoy the Esplanade, free concerts, and spectacular fireworks on the Fourth of July. In the winter, head for Boston Common and go ice skating on Frog Pond (rent skates at the rink). 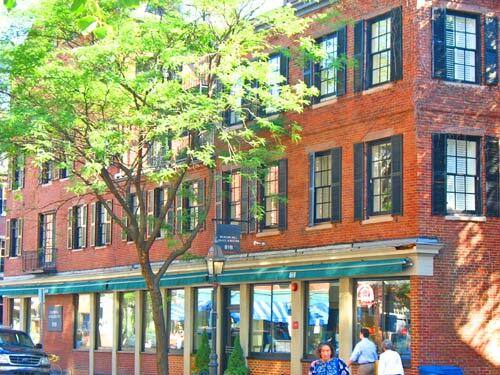 The hotel's owners, Peter and Cecelia Rait, created the Beacon Hill Hotel and Bistro from two historic townhouses built in 1830 and 1850 after starting and running a similar high-end boutique hotel in Portugal. As you'll discover if you stay here, the owners truly understand how to deliver hospitality and service. Although the 19th century exterior of the buildings remains intact, the interiors were completely gutted and renovated. As a result, the hotel retains historic charm, but also offers modern amenities such as an excellent heating/cooling system with climate controls in each room and an elevator. The reception area, a bar with a welcoming fireplace, and the cheery Beacon Hill Bistro take up most of the first floor. In warm weather, guests also enjoy sitting outside on the lovely roof patio. 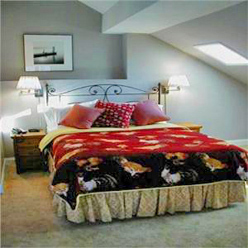 Upstairs are the hotel's 12 guestrooms and an in-room suite, plus a common area where guests can gather. Each of the rooms is individually decorated, much like you might find if you stayed in the guest room at the home of a well-to-do friend. In fact, you'll vow to refurbish your own guest room when you get home, after you find another place to store your skis, exercise equipment, children's outgrown clothing, and a chair that you've been meaning to reupholster . . . but that's another story. Each room has at least 2 windows with attractive wooden plantation shutters, allowing you to adjust the light. As a bonus, you can actually open the windows - a rare luxury among Boston hotels. The rooms have complementary high-speed wireless internet access, flat screen televisions, and DirecTV satellite service with movie channels. Black and white photos by photographer Daniel Jones decorate the walls. Bathrooms have stylish white pedestal sinks. One of the biggest treats when you stay at this favorite Boston boutique hotel is the complementary breakfast at Beacon Hill Bistro on the first floor. The Bistro's talented chef has turned it into one of the most popular restaurants in Beacon Hill for breakfast and brunch (as well as lunch and dinner). You'll get to savor his delicious smoked salmon omelettes, Belgium waffles with berries, French toast with strawberries and creme fraiche, pepper and cheese fritattas, and much more. 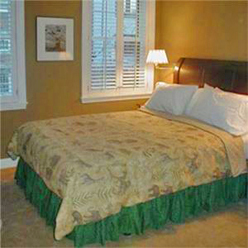 In short, you get all the benefits of a Boston bed and breakfast along with the conveniences of a full-service luxury hotel in one of Boston's most sought-after and exclusive neighborhoods. Guests tend to return again and again to the Beacon Hill Hotel and Bistro . . . so because of the small number of rooms available, you do need to book as early as possible here once you know your dates in order to get a reservation.